Scientists have uncovered a rare relic from the early universe: the farthest known supermassive black hole. This matter-eating beast is 800 million times the mass of our Sun, which is astonishingly large for its young age. Researchers report the find in the journal Nature. “This black hole grew far larger than we expected in only 690 million years after the Big Bang, which challenges our theories about how black holes form,” said study co-author Daniel Stern of NASA’s Jet Propulsion Laboratory in Pasadena, California. Astronomers combined data from NASA’s Wide-field Infrared Survey Explorer (WISE) with ground-based surveys to identify potential distant objects to study, then followed up with Carnegie Observatories’ Magellan telescopes in Chile. Carnegie astronomer Eduardo Bañados led the effort to identify candidates out of the hundreds of millions of objects WISE found that would be worthy of follow-up with Magellan. For black holes to become so large in the early universe, astronomers speculate there must have been special conditions to allow rapid growth — but the underlying reason remains mysterious. 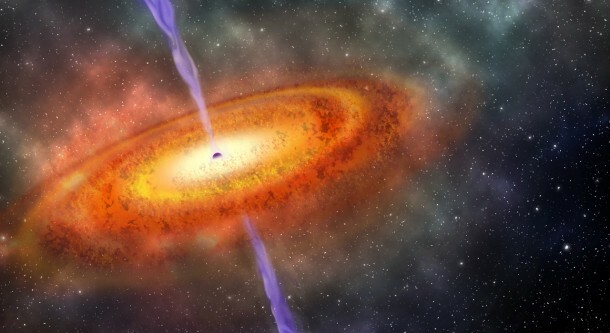 The newly found black hole is voraciously devouring material at the center of a galaxy — a phenomenon called a quasar. This quasar is especially interesting because it comes from a time when the universe was just beginning to emerge from its dark ages. The discovery will provide fundamental information about the universe when it was only 5 percent of its current age. “Quasars are among the brightest and most distant known celestial objects and are crucial to understanding the early universe,” said co-author Bram Venemans of the Max Planck Institute for Astronomy in Germany. Much of the hydrogen surrounding the newly discovered quasar is neutral. That means the quasar is not only the most distant — it is also the only example we have that can be seen before the universe became reionized. “It was the universe’s last major transition and one of the current frontiers of astrophysics,” Bañados said. The quasar’s distance is determined by what’s called its redshift, a measurement of how much the wavelength of its light is stretched by the expansion of the universe before reaching Earth. The higher the redshift, the greater the distance, and the farther back astronomers are looking in time when they observe the object. This newly discovered quasar has a redshift of 7.54, based on the detection of ionized carbon emissions from the galaxy that hosts the massive black hole. That means it took more than 13 billion years for the light from the quasar to reach us. Scientists predict the sky contains between 20 and 100 quasars as bright and as distant as this quasar. Astronomers look forward to the European Space Agency’s Euclid mission, which has significant NASA participation, and NASA’s Wide-field Infrared Survey Telescope (WFIRST) mission, to find more such distant objects. “Withseveral next-generation, even-more-sensitive facilities currentlybeing built, we can expect many exciting discoveries in the very earlyuniverse in the coming years,” Stern said.